A good discussion of activation functions can be found here. During neural network training, the weights and bias are repeatedly modified in order to produce a neural network result that has a minimal error (loss) compared to observed training examples. The activation function data flow equation is shown below. Input values v, weights w and bias b are fed to a summation function which passes its output s to an activation function g which in turn passes its outputs t to other network nodes. Faster convergence of stochastic gradient descent. Due to their linear, non-saturating form. Simpler, faster computation. Due to their linear form not involving exponential operations. They can be fragile and 'die'. If the learning rate is set too high, a large gradient flowing through a ReLU neuron can cause weights to update is a way that the neuron will never activate again. Sigmoids can saturate and kill gradients. Gradients (change) at the tails are almost zero. Sigmoid outputs are all positive values. This can bias network results. The effect can be mitigated by not using sigmoids in the final layers of a network. The Softmax function normalizes (in the case of softmax, "squashes") a K-dimensional vector z of arbitrary real values to a K-dimensional vector of real values in the range [0, 1] that add up to 1. Note that we're using the values of z as a power of e (Euler's Number) instead of using just z alone. This will change negative values to positive values and give disproportionately more weight to originally positive values. The tanh (Hyperbolic Tangent) function is the hyperbolic analogue of the tan circular function used throughout trigonometry. Compared to the Sigmoid function, tanh produces a more rapid rise in result values. Tanh can saturate and kill gradients. Gradients (change) at the tails of are almost zero. Calculus is used in machine learning to represent change. Training machine learning models and performing inference against those models involves a lot of change measurement, and calculus is used extensively for these operations. Differential Calculus is concerned with the study of the rates at which quantities change. The rules below provide a way to quickly determine the derivative of common functions. More complex functions can be broken down into progressively smaller components until these rules can be applied. The Histogram of Oriented Gradients technique counts occurrences of gradient orientation in localized portions of an image. So as we reduce the value of x the value of y will also decrease. Because we want to find the minimum value of y we want to stop iterating the reduction of x when y=0. In our example, we're able to look at the graph and see that the minimum is at y=0. But in actual SGD applications, the value of y is unknown. We won't be able to determine the exact minimum, so we'll want to stop the iteration of x when the reductions in x get very small. SGD will typically be used to find the minimum for a function of multiple variables, not just one as we used in our example above. Also, the vertical axis dependent variable is typically referred to as a cost, or loss, function. In our simple example above, we used the derivative of our function as part of the calculation to modify the variable x. Because we're now dealing with two variables, we'll use partial derivatives with respect to each variable. Geometry (from the Ancient Greek: geo- "earth", -metron "measurement") deals with calculations of shape, size, relative position of figures, and the properties of space. Graph theory is the study of graphs, which are mathematical structures used to model pairwise relations between objects. Graphs are important in machine learning because they can be used to define complex data flows. A graph is a structure of related objects. Below is an example of a graph with 6 nodes (also called vertices) 7 lines (also called edges). Graph nodes perform a variety of machine learning functions, inspired by neuron functions in the brain. Convolution performs a data operation using input matrix and bias data to produce an output matrix. For more complex graphs, this process can involve a large number of computations. A good discussion and demonstration of convolution can be found here. Memory functions retain information for use by other graph nodes. Pooling functions combine and simplify data. Multiple data elements from an input matrix are combined into a single element in an output matrix. A good discussion of pooling can be found here. Graphs such as Neural Networks employ a number of different types of data flow as detailed below. Backpropagation is used to modify the weights and biases applied to data flowing between neural network nodes. The backpropagation function B( ) repeatedly modifies weights and biases to reach a minimum value for the error value. The brain can be seen as a graph, where neurons act as nodes and axons act as edge connectors. This has given inspiration to the development of Artificial Neural Networks. start on an arbitrary vertex as current vertex. find out the shortest edge connecting current vertex and an unvisited vertex V.
set current vertex to V.
if all the vertices in domain are visited, then terminate. Information entropy is defined as the average amount of information produced by a probabilistic stochastic source of data. Generally, information entropy is the average amount of information conveyed by an event, when considering all possible outcomes. Entropy is zero when one outcome is certain to occur. The cross entropy between two probability distributions over the same underlying set of events measures the average number of bits needed to identify an event drawn from the set. Linear algebra deals with calculations of spaces defined by lines, planes and vectors. Eigenvalues together with eigenvectors define aspects of linear transforms on spaces. An eigenvector defines a direction that is not changed. An eigenvalue defines a length change related to the eigenvector. Below, in a shear mapping linear transform, the red arrow changes direction but the blue arrow does not. The blue arrow is an eigenvector of this shear mapping because it doesn't change direction, and since its length is unchanged, its eigenvalue is 1. A scalar is an element of a field which is used to define a vector space. In the diagram below, X and Y are scalars. The vector V is defined, in part, using the X and Y scalars. A vector norm is a function that assigns a strictly positive length or size to each vector in a vector space—save for the zero vector, which is assigned a length of zero. Now we can do backward substitutions through our sequence of equations to show a final result. Machine Learning models use mathematical concepts, structures, and algorithms to produce analytic and predictive results. The table and diagrams below provides a framework for understanding the types and varieties of these models using a number of grouping dimensions. Base Models are characterized by their fundamentally different approaches to Machine Learning and fall into two groups - graphs and relationships. These models are based on data graphs. These models are based on data relationships (correlation & dependence). Model Extensions are variations on base models the provide additional capabilities and approaches to the model fundamentals. Model Applications indicate some of the major application areas of Base Models. Curve fitting is the process of constructing a curve, or mathematical function, that has the best fit to a series of data points. In overfitting, a statistical model describes random error or noise instead of the underlying relationship. Overfitting occurs when a model is excessively complex, such as having too many parameters relative to the number of observations. A model that has been overfit has poor predictive performance, as it overreacts to minor fluctuations in the training data. In the example below, the green line represents an overfitted model and the black line represents a regularized model. While the green line best follows the training data, it is too dependent on it and it is likely to have a higher error rate on new unseen data, compared to the black line. Regularization is a process of introducing or removing information in order to solve an ill-posed problem or to prevent overfitting, as illustrated in the example below. Machine learning dropout functions are a form of regularization. Regularization is often accomplished by adding a tuning parameter to a model training process. A Support Vector Machine (SVM) is a set of algorithms constructed for classification and regression analysis. SVM models are normally trained using example datasets labeled as belonging to specific categories. These data points form clusters in a multi-dimensional space. The term support vector refers to vector lines passing through the data points at the edge of a cluster as shown below. An operation is a calculation from zero or more input values (called operands) to an output value. For a list of mathematical symbols, go here. Square root - a square root of a number a is a number y such that y^2 = a; in other words, a number y whose square (the result of multiplying the number by itself, or y⋅y) is a. A matrix (plural matrices) is a rectangular array of numbers, symbols, or expressions, arranged in rows and columns. Matrix mathematics is important in machine learning because data is often sent between the nodes in a model graph and operated on in a matrix format. Matrices are a mathematically convenient way to apply mathematical operations to sets of data. Basic matrix operations include addition, scalar multiplication and transposition. Matrix multiplication or the matrix product is a binary operation that produces a matrix from two matrices. For examples of multiplications of matrices of various combinations of dimensions, go here. Probability is the measure of the likelihood that an event will occur. Probability is quantified as a number between 0 and 1, where, loosely speaking, 0 indicates impossibility and 1 indicates certainty. The higher the probability of an event, the more certain that the event will occur. The central limit theorem establishes that, in most situations, when independent random variables are added, their properly normalized sum tends toward a normal distribution (a bell curve) even if the original variables themselves are not normally distributed. This provides a way to understand characteristics of a population of data points using only samples taken from that population. To see this visually, look at the example below. Random 0s and 1s were generated, and then their means calculated for sample sizes ranging from 1 to 512. Note that as the sample size increases the tails become thinner and the distribution becomes more concentrated around the mean. Events are independent if the occurrence of one does not affect the probability of occurrence of the other. If the coin toss is fair (no bias in the toss is introduced) there's a .50 probability of getting a head facing up. This is because of the finite number of possible results, in this case two - head or tail. No other outcome is possible. This is called a finite geometry, any geometric system that has only a finite number of points, in our case two. We are assuming that the coin cannot land on its edge, so it can only land in one of two ways, showing a head or tail facing up. Now that this result has occurred, it also cannot be changed due to the arrow of time. Why? Because the second toss probabilities were only .50 of .50. The first toss had already occurred and eliminated two of the potential result combinations, leaving only two of the four available total results. Of the four possible combinations, only one is possible with two tosses of the coin. Since each combination is equally possible, each has a .25 probability of happening. In probability theory, events E1, E2, ..., En are said to be mutually exclusive if the occurrence of any one of them implies the non-occurrence of the remaining n − 1 events. The Probability Density Function is used to specify the probability of the random variable falling within a particular range of values, as opposed to taking on any one value. This probability is given by the integral of this variable’s PDF over that range—that is, it is given by the area under the density function but above the horizontal axis and between the lowest and greatest values of the range. The probability density function is nonnegative everywhere, and its integral over the entire space is equal to one. In the graphic below, IQR is the interquartile range. Statistics deals with the the collection, analysis, interpretation, presentation, and organization of data. Below are some of the more prominent aspects of statistics used in Machine Learning. 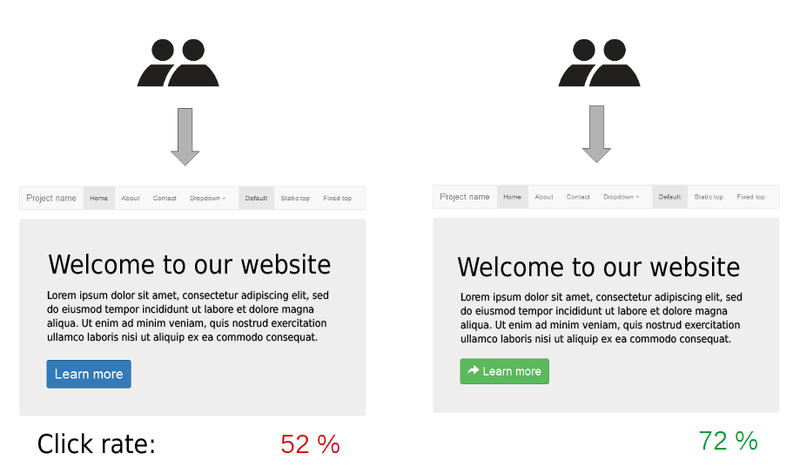 A/B testing is a controlled experiment with two variants, A and B. Classification is the problem of identifying to which of a set of categories (sub-populations) a new observation belongs, on the basis of a training set of data containing observations (or instances) whose category membership is known. The coefficient of determination, denoted R2 or r2 and pronounced "R squared", is the proportion of the variance in the dependent variable that is predictable from the independent variable(s). 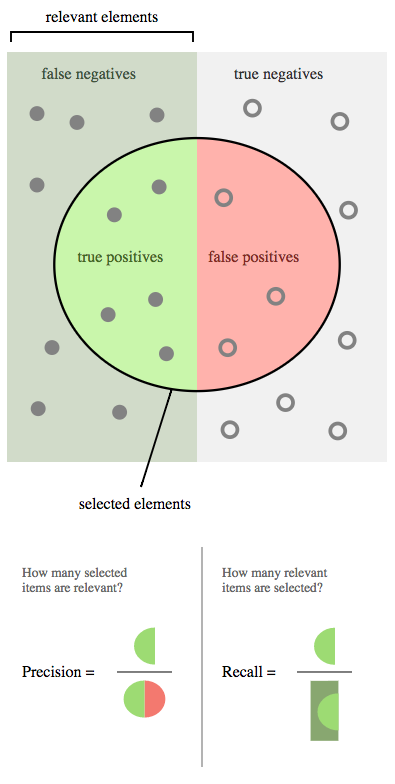 False positive and false negative errors can occur during statistical hypothesis testing. False positives and false negatives are also called type I and type II errors. Null Hypothesis (H0): also thought of as the default state of nature ... an example being healthy persons in a hypothesis test of the side effects of a new vaccination. Alternative Hypothesis (H1): is the negative of the null hypothesis, and indicates a state that deviates from the default ... an example being sick persons as a result of the side effects of a new vaccination. False Positive (type I error): the null hypothesis is true, but is rejected ... an example is a healthy person being indicated as being made sick in the test of a new vaccination. False Negative (type II error): the null hypothesis is false, but fails to be rejected ... an example is a sick person being indicated as being healthy in the test of a new vaccine. A hypothesis is a proposed explanation for a phenomenon. Hypothesis testing tests is a hypothesis on the basis of observing a process that is modeled via a set of random variables. The elbow method looks at the percentage of variance explained as a function of the number of clusters: One should choose a number of clusters so that adding another cluster doesn't give much better modeling of the data. More precisely, if one plots the percentage of variance explained by the clusters against the number of clusters, the first clusters will add much information (explain a lot of variance), but at some point the marginal gain will drop, giving an angle in the graph. The number of clusters is chosen at this point, hence the "elbow criterion". The law of large numbers is a theorem that describes the result of performing the same experiment a large number of times. According to the law, the average of the results obtained from a large number of trials should be close to the expected value, and will tend to become closer as more trials are performed. The experiment results are derived from a universe of potential results where an actual theoretical mean exists. In the example below, it's the mean of dice rolls, which is 3.5. The first experiment result establishes an initial distance from the theoretical mean. In order for the second experiment result has a finite probability of moving the observed averages farther away from the theoretical mean. That probability is a fractional number between 0 and 1. Let's call that probability p-2. Subsequent experiment results also have probabilities, p-n.
Each experiment result is an independent event. That is, one does not depend on the other. The joint probability of a group of independent events occurring is determined by their product. As you can see, the joint probability gets small very quickly. This is an over simplification, but it helps understand the mathematics at work. In the sample experiment below, notice that by 1000 trials, the observed averages variation from the theoretical mean has been reduced to almost zero. And by only a very small number of trials, the observed averages have come very close to the theoretical mean. Logistic regression is a regression model where the dependent variable (DV) is categorical. A loss function or cost function is a function that calculates the difference between true and estimated values. An optimization problem seeks to minimize a loss function. In machine learning, stochastic gradient descent and backpropagation are techniques used to reduce loss. Precision and recall are based on an understanding and measure of relevance. Precision: (also called positive predictive value) is the fraction of relevant instances among the retrieved instances. Recall: (also known as sensitivity) is the fraction of relevant instances that have been retrieved over the total amount of relevant instances. Repeatability is the variation in measurements taken by a single person or instrument on the same item, under the same conditions, and in a short period of time. Permutation: sample composition is randomly changes. Jacknife: systematically recomputing the statistic estimate, leaving out one or more observations at a time from the sample set. 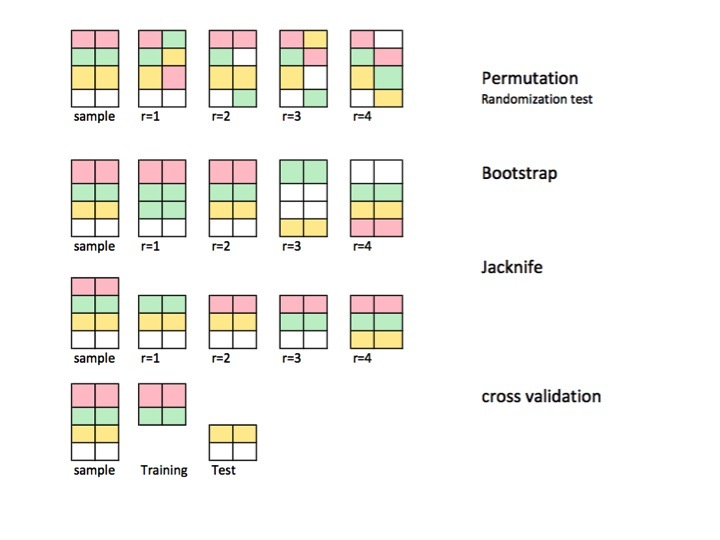 Cross-validation: subsets of the data are held out for use as validating sets. 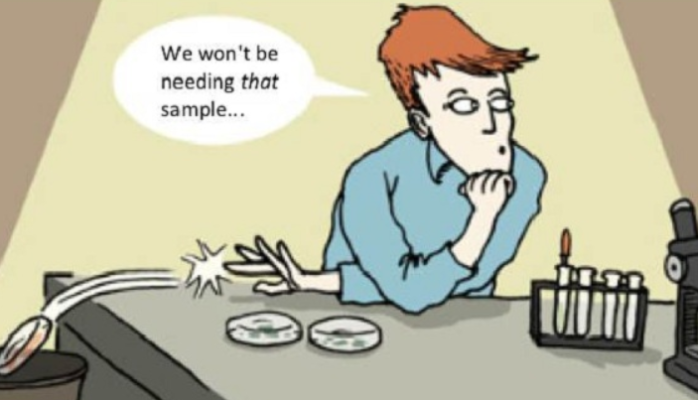 Sample Size: the sample size used in a study is determined based on the expense of data collection, and the need to have sufficient statistical power. The standard deviation (also represented by the Greek letter sigma σ or the Latin letter s) is a measure that is used to quantify the amount of variation or dispersion of a set of data values. A low standard deviation indicates that the data points tend to be close to the mean of the set, while a high standard deviation indicates that the data points are spread out over a wider range of values. The standard deviation of a random variable, statistical population, data set, or probability distribution is the square root of its variance. A simplified way to think of this is that roughly two thirds of the data points are within one standard deviation of the mean and 95% within two standard deviations. Statistical inference is the process of deducing properties of an underlying distribution by analysis of data. In machine learning, you'll often see the process of using a model to determine the characteristics of input data as inference. For example, the input might be the image of a person and inference is used to perform face recognition to determine the identity of the person. The statistical power of a binary hypothesis test is the probability that the test correctly rejects the null hypothesis (H0) when the alternative hypothesis (H1) is true. It can be equivalently thought of as the probability of accepting the alternative hypothesis (H1) when it is true—that is, the ability of a test to detect an effect, if the effect actually exists. Power analysis is an experimental technique for determining the effect of different sample sizes.